When roasting large cuts of meat in your wood fired oven we suggest our Suckling Pig Pan. 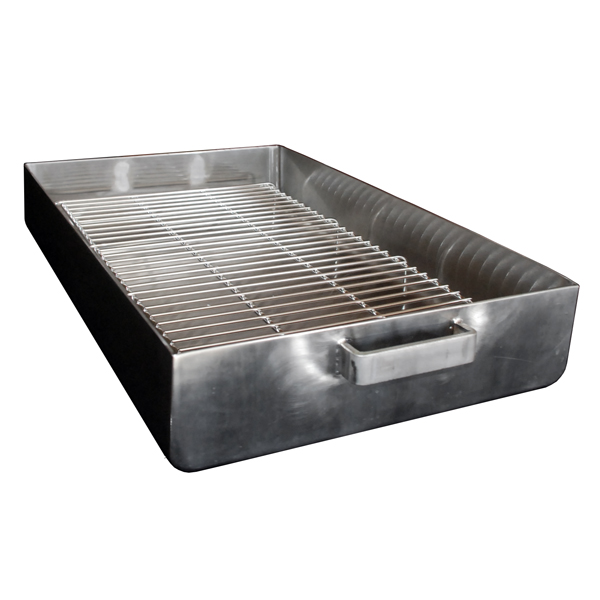 This professional grade pan is made to exacting standards from 304 stainless steel. A Wildwood original. Dimensions: 24″L x 15″W x 3″D Weight: 20 lbs. Wildwoods signature suckling pig pan is another must have item for increasing the versatility of your oven. Great for roasting several turkeys and chickens at a time, or whole primal cuts of meat such as whole legs, shoulders and more. Constructed of heavy duty stainless steel, it can withstand ultra-high temperatures without warping. Doubles as a fryer when set over hot coals. perfect for loading it up with potatoes, brussel sprouts and any other vegetables you can imagine! Fantastic when cooking for large groups of people. Combine this with our Tuscan Grill rack to elevate the meats inside the pan. Made entirely of 11 gauge 304 stainless steel this is one pan that will last a lifetime!